MSR Thru-Hiker 100 Wing. 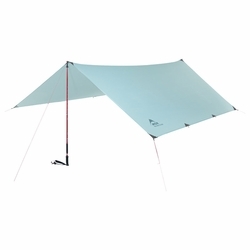 Offering essential ultralight protection for minimalists, thru-hikers and long-distance backpackers, the Thru-Hiker 70 Wing and 100 Wing keep wind and rain at bay with minimal impact on total pack weight. The 70 Wing accommodates 2-3 people and weighs as little as .38 kg (12 oz), while the 100 Wing offers ample room for 3 backpackers at a minimum weight of only .49 kg (1 lb 1 oz). Use a wing shelter by itself on a fastpacking trip along the John Muir Trail, or pair one with the Thru-Hiker Mesh House 2 or 3 (sold separately) for added wind and rain protection on a long-haul trip up the Continental Divide. Ultralight: Ample rain protection with minimal impact on total pack weight. Adaptable: Set up with trekking or accessory poles, or suspend from a tree. Compact: Both wings pack down tiny and fit in the smallest of backpacks. Compatible: Either wing can be paired with Thru-Hiker Mesh House 2 or 3. Trekking poles and Thru-Hiker Mesh House sold separately.